Pinterest board - what does it say? Today's outfit started with my green/black Ikat print dress from Cleo Petites. It is definitely one of my favourite dresses. I topped it with my black leather blazer, which I have to say is one of my best purchases EVER. I'm so glad I splurged for this jacket. I'm wearing black diamond pattern tights and my tall black leather Blondo boots for footwear. On top of everything when I head out the door is my shiny silver grey trench coat. I'm wearing my black/white leather handbag and jewelry is just a ring. What do you think? Does this all work together? Is it too heavy with the black tights? As always, all comments/suggestions welcome. Trying out the Angie formula of a chunky knit sweater with a skirt. I thrifted this chunky fisherman knit sweater about two weeks ago and I can't believe I like it! I always said I wouldn't/couldn't wear something like this but I guess you CAN teach an old dog new tricks! 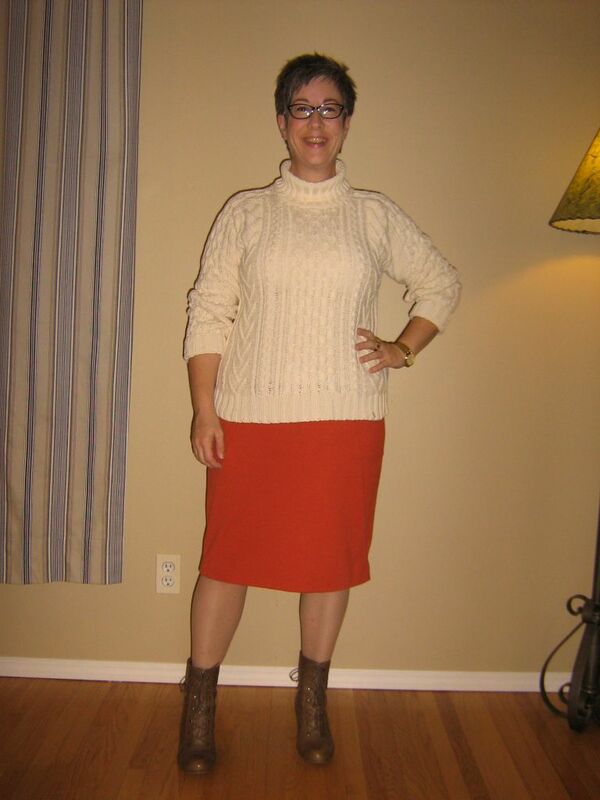 I've paired this sweater with my orange knit pencil skirt, olive/taupe lace up boots and my snakeskin handbag. I like how the boots pick up the darker, taupe tones in the handbag. For jewelry, I'm wearing my gold watch and a chunky gold ring. On top of everything when I head out the door, I'm wearing my plaid cape. I always feel a little like Sherlock Holmes when I wear this cape - lol! What do you think? Does this all work together? As always, all comments/suggestions welcome. My MIL bought me this beautiful clutch yesterday and I wanted to use it right away, so that was the starting point for my outfit this morning. I've paired this clutch with my black/white striped blazer, a red cowl neck tank and a pair of simple black trousers. On my feet today are my Clarks shoes (almost shooties). On top of everything when I head out the door is my black quilted jacket. For jewelry today, I'm wearing my vintage black enamel/gold/faux diamond bracelet. What do you think of this outfit? 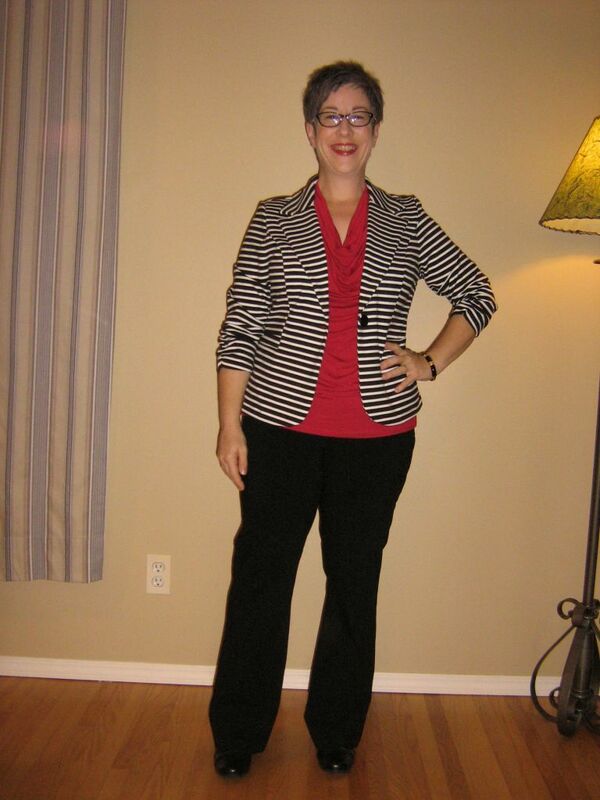 How is the pattern mixing with the animal print clutch and striped blazer? As always, all comments/suggestions welcome. Please indulge me my fellow fashion lovers - I started a Pinterest page a while back and I'm very curious for you to see it. For those that have known me for a while on this forum, you know my rubric has included structure/colour/classic/retro&vintage/urban. Do you see those style elements on my board of things I like and adore? Do you see a different style starting to emerge? Rachylou mentioned last week that she felt my style might be moving toward more modernist. This intrigues me. I'm just curious to know what your eyes see and what is says about me and my style. I always think other people have a clearer view, you know? I had to go to Sephora today to replenish a few of my supplies and asked MIL if she wanted to come with me. Well...she had a BLAST! She got chatting with one of the salesgirls, who was just adorable and sweet. MIL got asking about makeovers and the young SA said that yes, they do them for an hour with a $50 charge. MIL thought this sounded like so much fun so I just turned around and asked if they would have time now and it would be my treat. An hour later my MIL looked absolutely GORGEOUS and I swear she stood 2 inches taller 'cause she felt so good. We wandered around the mall for a good two hours looking at all the beautiful holidays outfits that are making their way into the stores now. On our way out, MIL spotted a lovely little red and animal print clutch, grabbed it and nearly ran to the counter to pay for it. I thought "wow, good for her" and then as we got into the car she presented it to me...said as soon as she saw it, it said "Shannon style" to her. How sweet is that? I'll show you with an outfit in the next few days. We had a truly wonderful girls day out. I'm blessed, truly blessed. BTW MIL has tried the electronic cigarette again and now uses nothing but. She hasn't had a real cigarette in about 4-5 days and we couldn't be more thrilled. Anyway, here's what I wore. 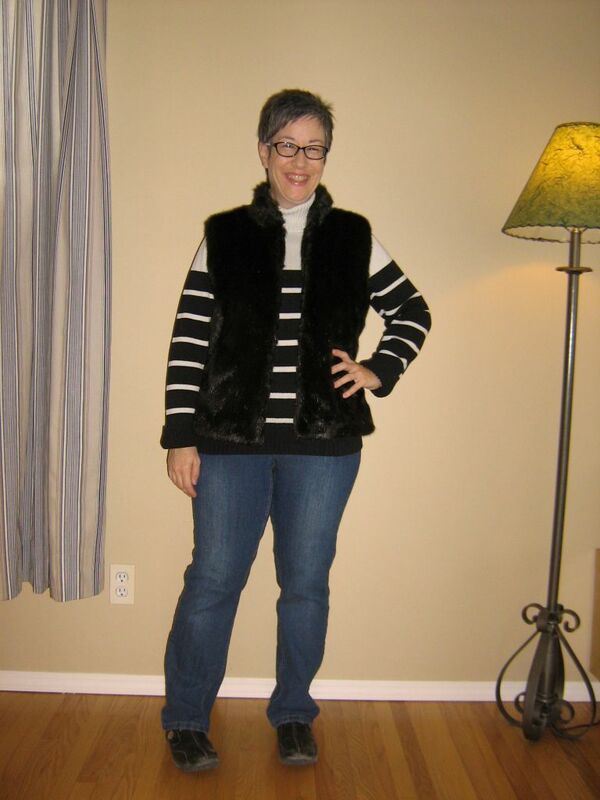 Just a casual pair of slightly faded straight leg jeans, a cream and black striped loose turtleneck sweater and my faux fur vest. Footwear is a pair of black leather Clarks. Hope it looks ok. I woke up this morning to snow on the ground so more winter friendly footwear is in order. Just wondering if these Naot boots work with the rolled BF jeans? It looks ok to my eye but definitely need your keen style eyes ladies. BTW I bought these Naot boots at the beginning of last winter and they are the most comfortable boots I have ever owned. Extremely warm, great grip on ice and snow, fabulous removable footbed, durable leather and some funky detailing. I have a confession. When things didn't work out so well with the Silver jeans I had bought, I promptly went to Winner's and bought a replacement pair and didn't post a K/R. This was just before I went on SYB so I'm safe there. These are Suko, not the best brand by any means, but the fit was really good, they were $16 and they will work until I find my "perfect" pair. These border on being improper PPL but they are better IRL then they show in pics - they are about 1/4 - 1/2 inch off the floor. 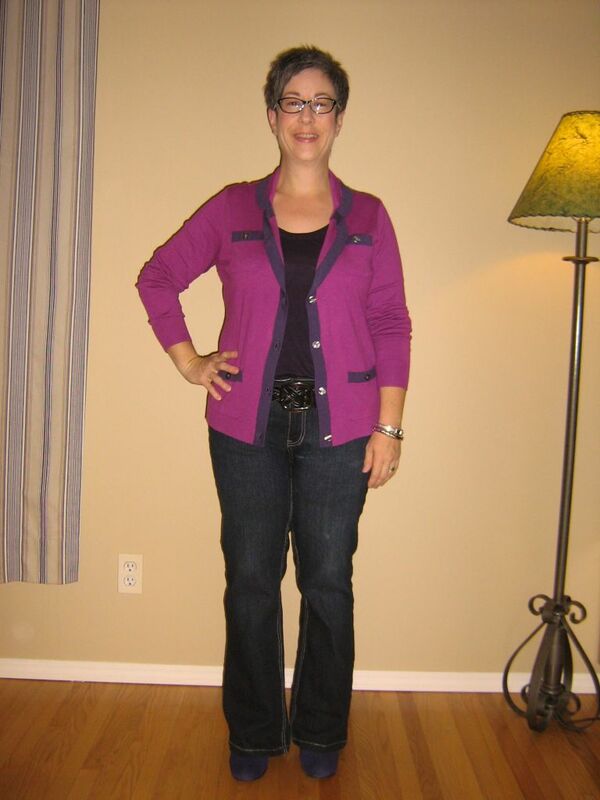 I've paired the jeans with a dark purple tank and my Halogen tipped fuschia/purple cardigan. I've popped on a wide black woven leather and studded belt with a big buckle. On my feet I've got my purple booties. For accessories I have my Christopher Kon leather handbag and a bit of arm candy in the way of a silver bangle and watch. On top of all that when I head out the door, I'm wearing my quilted short jacket. What do you think? Does this all work? Proportions ok? As always, all comments/suggestions welcome. Today's outfit started with this pink scarf, in support of BCAM. I've had this scarf for several years but didn't wear it too often. Last night I cut off the fringe and stitched the two ends together making it into an infinity scarf and now I love it! 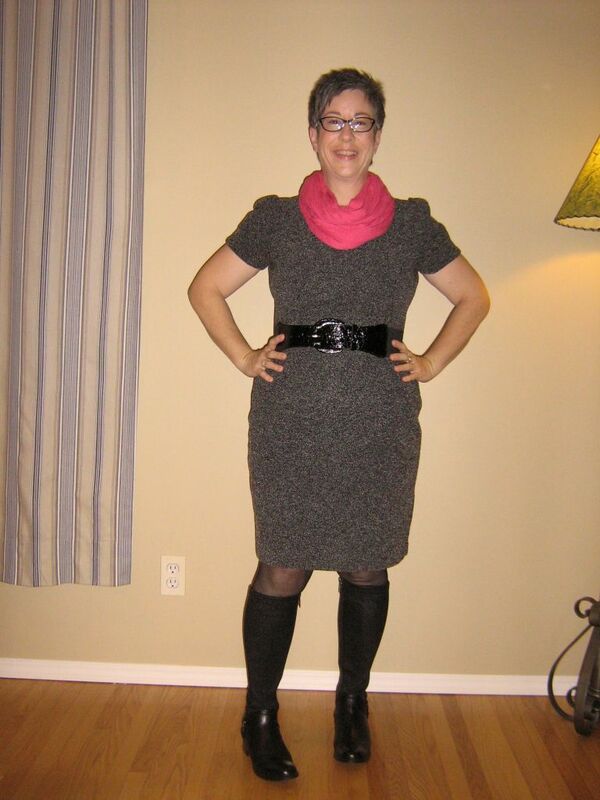 This is also my first try at the chunky scarf over a dress and jacket look. 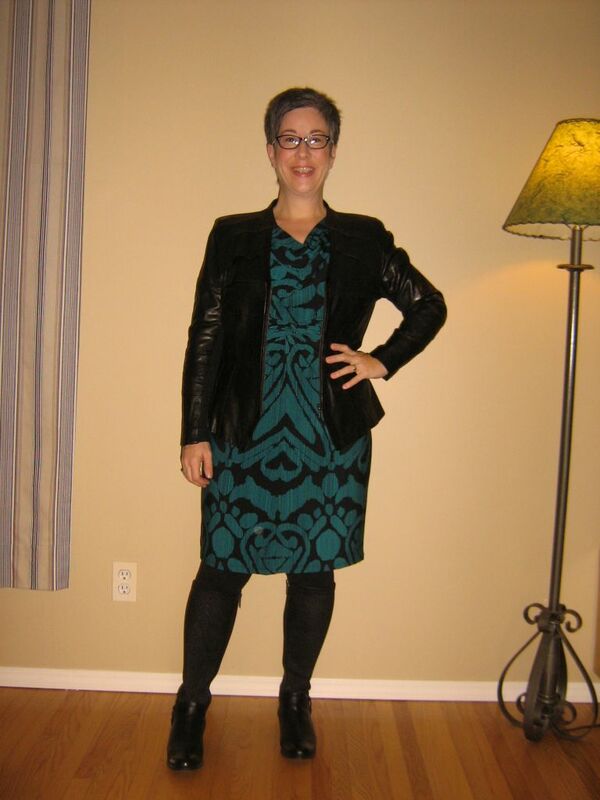 I'm wearing my old as the hills boucle knit sheath dress and my black leather blazer over that. I realize this look would probably be better without the belt but my waist needed some reining in today, if you know what I mean. I finished off the outfit with the first wearing of my Blondo Vergara boots, black micro fishnets and my black/white leather handbag. So what do you think? Does this all work together? Can a short-necked petite gal wear a big scarf like this? As always, all comments/suggestions welcome. 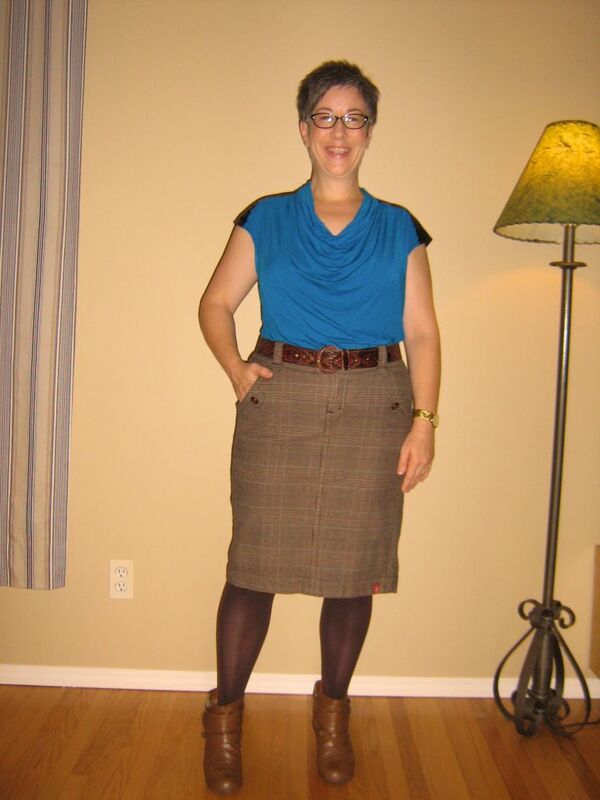 Today is the debut of my Esprit plaid skirt, that has dark brown, camel and blue for colouring. I found this in my local thrift store a few weeks ago but had to get Wonder Woman to restitch the lining as it had separated from the skirt. I love the substantial weight of this skirt. It's a heavy cotton, fully lined and has big belt loops. I've topped the outfit with my cognac faux leather jacket, which I do wear indoors as my office is quite chilly. I've popped on my men's vintage tribal belt to fill those belt loops, and for my bottom half, I'm wearing chocolate brown tights and my short brown booties. Of course when I head out the door, I'll top everything with my silver trench. What do you think? Does this all work together? Are the proportions ok? As always, all comments/suggestions welcome. I have one of those physical kind of days at work today - running around with some lifting and packing, so comfort is key. 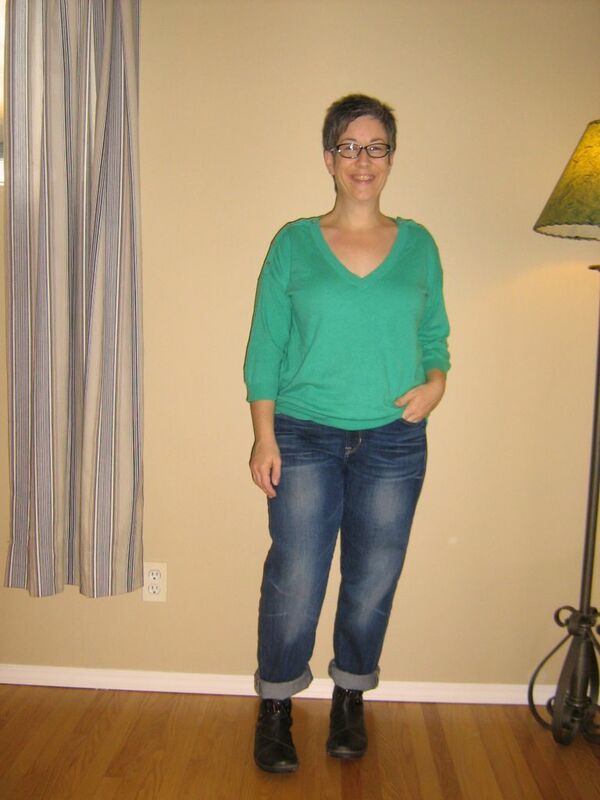 I started with my black slouchy trousers and added my dark purple v-neck merino wool sweater. For comfy footwear, I'm wearing my Doc Marcie boots. Then for a bit of pattern and a wee bit more colour, I've added my animal print belt. My handbag today is a grey faux snakeskin day clutch. 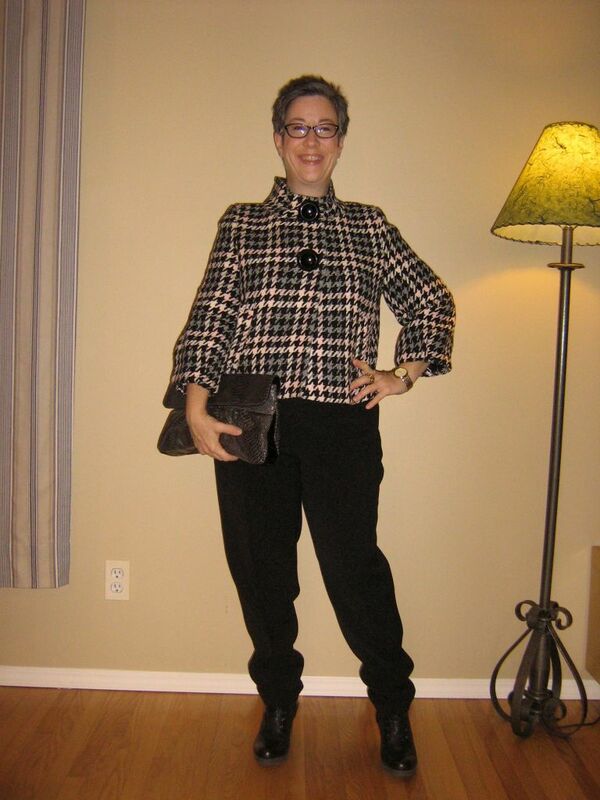 For outwear, I'm wearing a large houndstooth print, cropped swing jacket in light pink, cream and charcoal. Jewelry is my gold oversized watch and a ring. What do you think? All work together? As always, all comments/suggestions welcome.